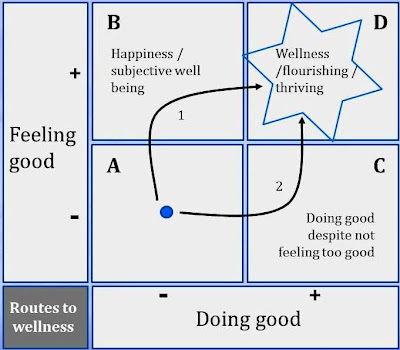 Imagine two axes, one about feeling good (being happy and satisfied with your life) and the other one about doing good (adding value to the world). If we combine those two axes we get four quadrants, let's call them A, B, C, and D (see the picture below). Quadrant A is the least attractive (not feeling good and not doing good); quadrant D, the most attractive. Here is a question: Imagine you are in quadrant A and you would like to end up in quadrant D. What seems like the best route you might take: route 1, which goes from A, via B to D, or route 2, which goes from A via C to D? Hy Coert, tank for the interesting question. I will personally try to pass across and between the quadrands assuming that being happy and satisfied is related with doing good and adding value to the world. So i will stretch the two way line into a straight one that goes from A to D, touching the balance between B and C quadrants.